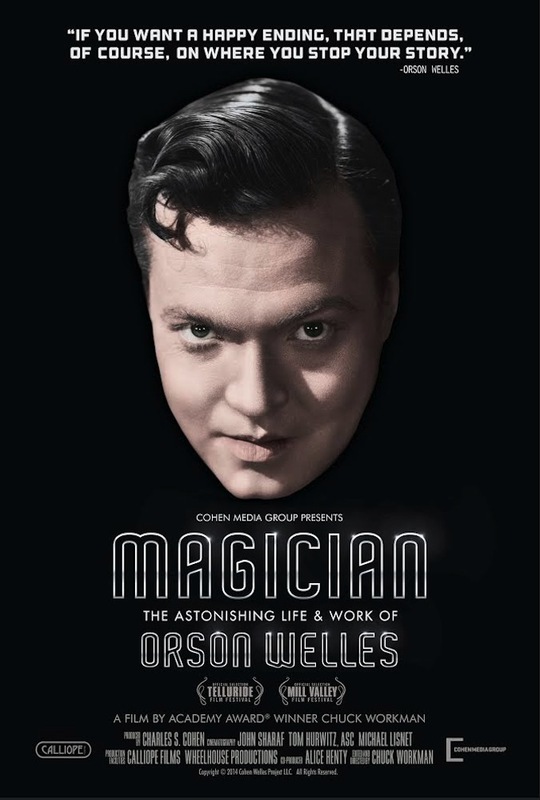 MAGICIAN: THE ASTONISHING LIFE AND WORK OR ORSON WELLES has one decisive thing in its favour — it’s on the side of its subject. 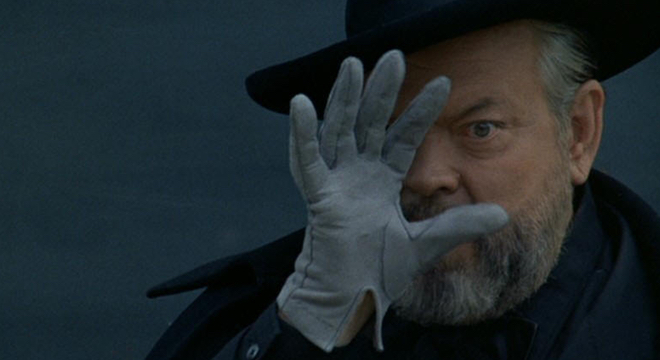 American documentaries about Welles have tended to take an antagonistic view — there’s something about seeing Welles as, ultimately, a failure, which is immensely comforting to mediocrities. It’s wrong to aspire to greatness, you’ll never make it, so Three Cheers for the Ordinary! Showmanship instead of Genius. But Chuck Workman is a really terrible name to have if you’re setting out to make a film celebrating genius, I have to say. God, it’s really unfair to pick on a guy for his name, isn’t it? Forget I said it. The problem with the documentary… no, I can’t make it that simple. First among the documentary’s problems is that it tries to cram too much in. This was always going to be tough, when you look at the number of books and documentaries and fictional representations of Welles — such Simon Callow’s still-unfinished trilogy of biographies. How do you do justice to all that, if you’re tackling the plays as well as the films, the incomplete, unreleased works as well as the known classics? You don’t. The decision to include everything, or a bit of everything, looks heroic at first but is possibly the result of indecision. What else can explain the fleeting reference to the controversial restoration of OTHELLO — “It has a few problems,” — a subject dropped as soon as it’s raised, with absolutely no exposition of what the problems are. Even getting into this subject takes us out of chronology and into Welles’ posthumous reputation, so it derails the narrative. This is a movie that insists on touching upon every point but is in too much of a hurry to elucidate anything. The most egregious effect of the need for speed is the treatment of the film clips, all of which are recut, compressed, turned into edited highlights — Workman even plays music underneath to further condense, distort. His idea of the kind of edit you can get away with is also hopelessly optimistic, so that he chops lines together as in a movie trailer, resulting in bizarre non-sequiturs, making blurting blipverts out of some of the best-known scenes in American cinema. When the expected line doesn’t follow, or follows five seconds too soon, the audience member familiar with the clip is thrown for a loop. The audience member new to all this is in an even worse position, force-fed a bowdlerized, mangled version of LADY FROM SHANGHAI or THE THIRD MAN. It’s hugely ironic that a movie which takes Welles’ part should re-edit his films as viciously as ever Columbia or RKO could manage. Added to this, quality control is low: an early montage of framed photos of Welles features one shot with a Magnum watermark pasted across it — stolen from the internet, defaced, not paid for, thrown out there in the hopes that we won’t notice the very thing we’re being shown. Music choices are hackneyed, anachronistic, inappropriate (L’Apres-Midi d’un Faun for THE TRIAL??) and rather than bolstering the emotion of the clips they play under — the presumed purpose — they frequently undermine it. Clips are sourced from all over, some of them seemingly from YouTube, so the resolution fluctuates like crazy. 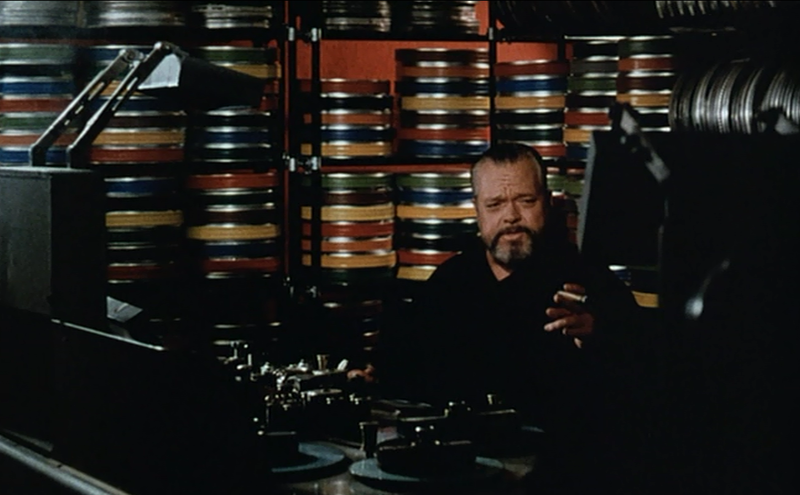 Most of the best stuff comes from Welles’ giant BBC interview, broadcast as Orson Welles: Stories from a Life in Film, but this is hacked up too. 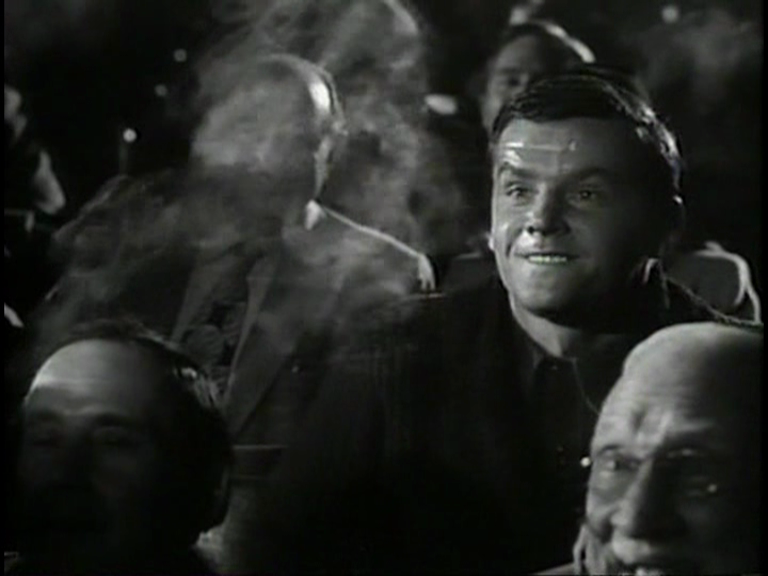 There’s nothing as egregious as the ending of The Battle for Citizen Kane, which has Welles saying “I think I made essentially a mistake staying in motion pictures,” but leaves off what he said next — “but it’s a mistake I can’t regret,” which is followed by a heartbreaking, inspiring speech about his love of film. But Workman does use the interview as a source for random pull-quotes, so that some lines do duty for subjects they originally had nothing to do with. It’s a very insidious form of misquotation. Sometimes, people whose big mouths have gotten them in trouble complain of being “quoted out of context” (all quotes are, by their nature, somewhat out of context) — Welles is being quoted in contexts he never knew anything about, contexts devised thirty years after his death by a bloke called Chuck whose day job is editing the Oscars. The compassion for Welles is admirable, and I think the section on his love of food was skillfully done — affectionate without degenerating into fat jokes. and there’s a nice bit where different Welles interviews are cut together to show how he would vary a story each time he told it. Where the movie has a strong idea, it’s on solid ground, but this rarely happens. Of the critical thinkers on display, James Naremore makes the best contribution. I would have liked more of Christopher Welles and even the dreaded Beatrice. Oja Kodar’s bit comes across like unedited rushes, jumping from subject to subject which may well be the way she talks, but the filmmaker is supposed to supply shape. She says some lovely stuff, and announces her willingness to be shamelessly indiscrete — I wish she was allowed to be. Still, this could be an important moment even if the film is mainly a missed opportunity — a film from America which is resoundingly pro-Welles, which sees the truncated and unfinished films as the fault of a system rather than of the man, which debunks “fear of completion” and admits that the Philistinism of the film industry is the more serious problem — this is a new development, and worthy of celebration in this centennial year.